"Daroth Grimault's some kind of rabble-rouser, fancies himself a visionary. Thing is, they've tried killing him before.... it didn't stick. Now this fampyr's set up some kind of cult in the catacombs beneath the Copperlane district in Defiance Bay. The ducal palace wants him removed. Permanently." You'll find Grimault in the Copperlane Catacombs (#1). He'll have a bunch of vessels with him: guls, skeletal wizards, and even a fampyr. Grimault and the fampyr will charm your characters, making them annoying, but we'd recommend killing everything else first and then concentrating on them. When Grimault dies he'll drop Daroth Grimault's Head. When you deliver the head to Warden Fyrgen, he'll give you your 2500 cp reward. "Some alchemist in Mercy Vale wants the head of Glasdial the troll, also known as the Green Death. The fellow didn't say what he wanted it for, only that he's willing to pay very well. If that suits you, I'd suggest you look for Glasdial in Lle a Rhemen." 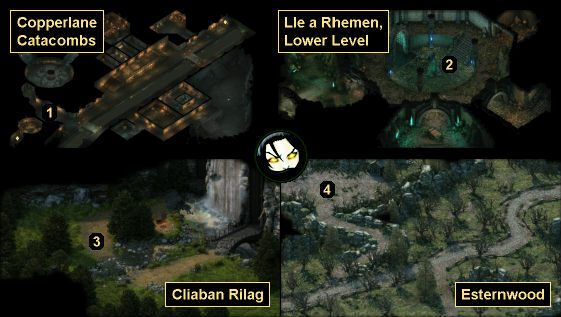 You'll encounter Glasdial in the lower level of Lle a Rhemen, which is located in Stormwall Gorge (#2). Glasdial will have some pwgras, corrupted druids, and swamp spores with him, so you should immediately retreat. That way you'll be able to take on the mobile enemies first, and then the spores by themselves afterwards. Glasdial will drop Glasdial's Head when it dies. When you deliver the head to Warden Fyrgen, he'll give you your 2500 cp reward. "Songsmith Roska is a Norwaech chanter. She and her associates have been looting Engwithan ruins, and the Glanfathans at Ibrel's Well want her to pay for her crimes. And they'll pay to see it done. Roska has a camp outside of Cliaban Rilag." You'll find Roska in the western half of Cliaban Rilag (#3). She'll have some prospectors, delvers and sappers with her. Take out the sappers first since they're the spellcasters, and then mop up the rest. Roska will drop Exceptional Plate Armor and Songsmith Roska's Head when she dies. When you take the head to Warden Fyrgen, he'll give you your 2500 cp reward. "Thorfen, a high priest of the Scattered God, has been desecrating gravesites all over Dyrwood. No idea what he's looking for, but he and his men killed a squad of Crucible Knights sent to stop him, and now they want his head." You'll encounter Thorfen in the cemetery in Esternwood (#4). He'll have two wardens, a warmage, and two zealots with him. Take out the warmage right away, and then finish off the rest in any order you want. You'll find lots of "fine" equipment on the corpses, and Thorfen will drop an Exceptional Mace, an Exceptional Medium Shield (Heater), the Coat of Ill Payment, and High Priest Thorfen's Head. When you deliver the head to Warden Fyrgen, he'll give you your 2250 cp reward.